Post: Gaurav Akrani. Date: 9/24/2010. Comments (7). Label: Banking. 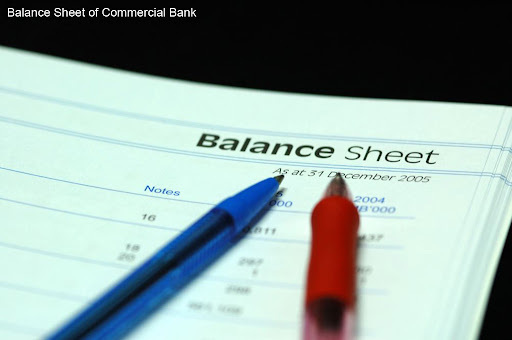 Commercial bank's balance sheet has two main sides i.e. the liabilities and the assets. From the study of the balance sheet of a bank we come to know about a system which a bank has followed for raising funds and allocation of these funds in different asset categories. Bank can have others money with it. It can be in terms of shareholders share capita, or depositors deposits. This money is the bank's liabilities. On the other hand bank's own sources of income leads to generation of assets for bank. Bank's liabilities constitute five major items. The share capital, the contribution which shareholders have contributed for starting the bank. Reserve funds are the money, which the bank has accumulated over the years from its undistributed profits. Deposits are the money owned by customers and therefore it is a liability of a bank. There can be various kinds of deposits and recurring deposits. Apart from these items a bank can borrow from central and other commercial banks. These borrowings are also treated as bank's liabilities. Bank's assets comprises cash, money at short notice, bills and securities discounted, bank's investments, loans sanctioned by the bank, etc. Bank's cash in hand, cash with other banks and cash with central bank (RBI) are its assets. When a bank makes money available at short notice to other banks and financial institutions for a very short period of 1-14 days it is also treated as bank's asset. Apart from these items bank always make money available to people on the form of loans and advances. They are also become bank's assets. I found this piece very informative. Thank you for preparing such as concise piece. This is a very simple definition of balance sheet even, for a layman. it is easy to understand. Quite commendable, please keep up the good work. Very lucid,carved nicely and precisely where a layman could understand .Thank u and please keep going .